I wish I had bought this years ago. When the weather gets to minus five celsius, I bring out my ushanka and my head immediately thanks me. Any colder than minus 10 and the ear flaps come down. Keeping your head very warm makes the rest of your body feel warmer, too, since you lose so much head from your head. This ushanka provides a thoroughly superior level of warmth from a simple cap. I followed the provided measurement instructions, and the fit was perfect. Hello, I just wanted to write and tell you I am extremely satisfied with your products. I have ordered several hats from you and they are very warm and well fitting. Best hat anybody could ever want on a cold, windy, Nebraska winter night. I will definitely order from you again. The latest hat I ordered was made in Ukraine, which seems to be better quality, it has more back of the neck coverage and folds up more neatly than the Russian ones. I just thought I'd give you my opinion. Thank you for the great service and great hats! Excellent product. Great fit and construction. Only took 3 days to receive it. Will definitely purchase more for the kids. I love this hat it is very warm and great for the very cold. I bought the first ushanka a couple of years ago, because my son was learning about WW2 in school and badly wanted one. The field soldier ushanka was fantastic and he wore it until he grew out of it. Still looks the same and friend's kid now wears it. (Wouldn't take it off first three days, slept with it!) With all the snow and cold here this year, I remembered your site and ordered the rabbit fur ushankas for both my boys this time. The order arrived today, THREE days after I ordered it in perfect condition. You should have seen the level of excitement. They're soft, they're warm, they're fluffy, they're perfect. Now my husband wants one, my Dad is hinting for one, my Mom would like one for the ladies, and what the heck, I want one too! I'll be ordering more and telling friends about you! Thank you, Valentina, for the excellent product and fantastic customer service experience!!! The most beautiful and warmest hat I've ever had! Very good quality, well made. Fast service. great job! Shipped fast. Excellent, as described - beautiful! By far the coolest hat I have seen; and the warmest! Looks, feels & smells real! Item arrived early. Excellent quality. The Ushanka arrived on time and in perfect condition. It is very warm and comfortable to wear. The only problem found was with the sizing, which ran a bit snug. 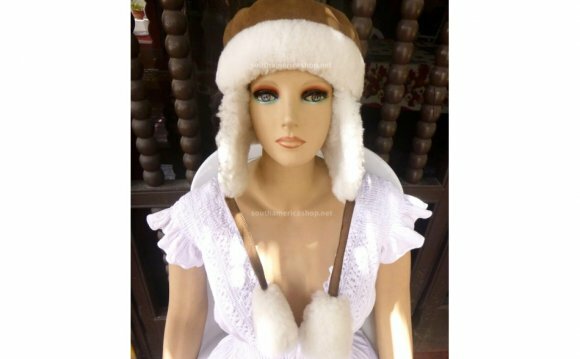 This was easily remedied by stretching the Ushanka according to the instructions located on the seller's web site. After one day of stretching the hat fits perfectly. Hey just wanted to say I rec'd my Ushanka today and could not be more happy with it. In the last three months I have bought and returned about seven different Ushanka's all of which were second rate, made in China, and of poor quality. I am replacing an Ushanka I bought about ten years ago and literally thought I was out of luck until I happened across your site. Why I didn't think to put a in my browser window escapes me but I found you nonetheless. Thanks again, glad you are in business and delivering an exceptional item in a field of sub-par products. Seller was prompt in solving a problem with the order. Very conscientious.